The gourmet food market boomed after the year 2000 due to a renewed interest in maintaining better health and nutrition, and this new desire to elevate foods to exquisite levels applies to virtually any type of meal including pizza. Some associate gourmet pizza with home grown, organic ingredients. Others view the term as referring to exotic or unusual ingredients. Instead of simply adding cheese, mushroom and sausage toppings to pizza sauce, gourmet choices might include Gorgonzola Neapolitan cheese, Shiitake mushrooms and chicken sausage. Some of the more popular elite toppings include artichoke hearts, bean sprouts, Cajun shrimp, chicken, crayfish, dandelions, eggplant, oysters or tuna. However, extravagance does not come without a price. 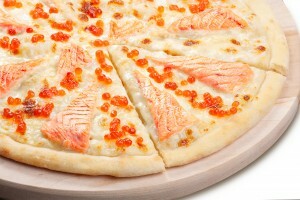 Take a look at some of the most expensive gourmet pizzas on the planet. Created at the Domenico Crolla Restaurant in Haggis, Glasgow, Scotland, this delectable pie commemorates famed fictional British agent James Bond. On top of the crust and sauce, gourmet fanciers are treated to champagne-soaked caviar, lobster marinated in 100-year-old Cognac and a sprinkling of 24-carat gold dust. Favitta’s Family Pizzeria in Henrietta, New York crafts this unusual romantic delight that begins with a large heart-shaped crust. Guests then have their choice of toppings, which are then baked to a scrumptious molten finish. The elaborate price tag has less to do with the actual pizza as it does the surprise accompaniments. Needless to say, the special meal is reserved in advance, as the lucky lady is presented with an exquisite diamond ring. The couple then celebrate their pending nuptials with a bottle of Dom Perignon. The Luis XIII restaurant in Salerno, Italy, offers this unbelievably expensive gourmet treat. The special dough used for the crust requires three days of preparation. The house sauce is then expertly added and topped with buffalo mozzarella, three kinds of caviar, and Norwegian and Cilento lobster. The finished masterpiece also receives a light dusting of pink Australian sea salt. Though the ingredients are considered haute cuisine, the ostentatious price is due to the fact that three restaurant chefs arrive at your home with all of the necessary ingredients. The trio assemble, bake and present their creation in the privacy of your villa. Americans need not go to New York, Italy or Scotland to enjoy mouth-watering pizza. For the majority of pizza lovers, a great pie does not cost thousands of dollars and pizza delivery in 89101 is available at a fraction of the cost.